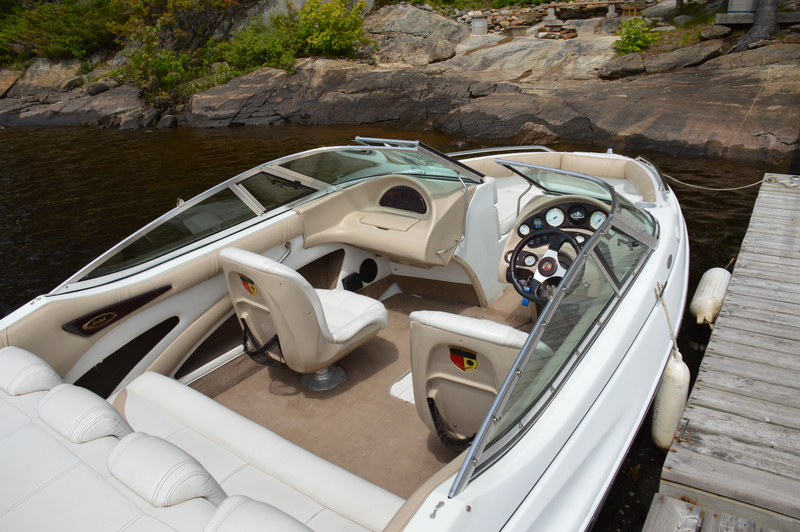 When looking for a used boat you will come across a variety of models from companies that no longer exist. That’s no reason to shy away. Sometimes these boats can be purchased at a lower price than a similar model from a manufacturer still in the game. Besides, most often the players who make the engines and parts of the boat are still in business, meaning servicing and repairs are possible. One such boat is the Mariah 182. The traditional bowrider’s look and style reflect the monochromatic colours and soft lines of the early 2000s. The hull tapers gently to the bow, with a pronounced rake in the stem, unlike many current designs. Aft, the lines curve into the transom above the small, but functional integrated swim platform. The windshield design is sleek and protective but makes boarding a bit restricted. Mariah’s have always had excellent cockpit upholstery and the 2000 is no exception. The design and details are well executed, as illustrated by the headrests on the aft seat. The cockpit is a reasonable size for an 18-foot boat with a 92-inch beam. The aft bench seats three adults or four children. The sunpad opens easily with twin gas struts. A removable storage tray covers the MerCruiser 4.3LX V-6 with additional storage outboard of the engine. The helm seats are fully adjustable moulded fibreglass, with plenty of foam padding to make them quite comfortable. The helm instruments and key system switches are placed in two rows front and centre and the Sony marine stereo is accessible from the helm as well. The passenger console has a large lockable glove box and a drainable locker. Bigger items can be placed in the ski locker. The bow seating is ideal for reclining facing forward. The cushions and bolsters are thick and comfortable. The seat bottoms are hinged, making access to storage easier. The bow cushion lifts out to provide unfettered access to the anchor locker. But there are a few caveats that go with boats of this age. Overall, the Mariah 180 was in pretty good condition. It had just come out of winter storage so it needed a good clean and had some rodent damage to the upholstery. When you are shopping for used boats, try to view several of the same model to get a sense of condition and price. Some faults you may be able to live with, others you may not. 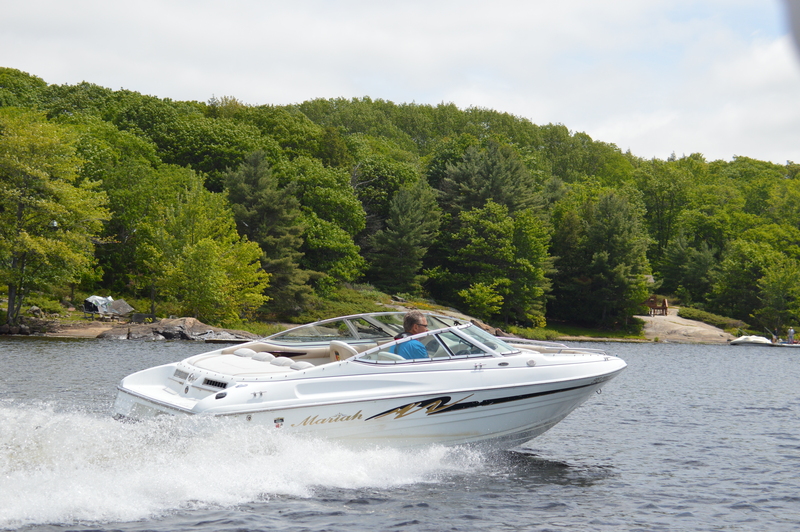 In terms of performance, though the boat had just been launched, the MerCruiser 4.3 LX started readily and idled smoothly away from the dock. With moderate bow rise the 182 planed in 7.25 seconds. Lightly loaded the lifting strakes elevated the hull and the Mariah cruised at 26.7 at 3,000 rpm. Top speed for the day was 42.3 mph at 4,500 rpm. As expected, turns were uneventful, and smooth, no worries about hooking or sliding. This 2000 Mariah makes a great cottage or trailerable boat and being 16 years old should mean a good purchase price. This boat is featured in the Fall 2016 issue of Boats&Places.